What better way to say "we care about you" than "we care about your health." 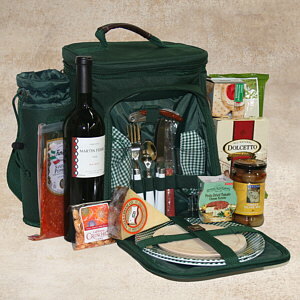 With FanciFull Gift Baskets' new line of gift baskets, you can get the message across. Filled with organic foods and beverages, the baskets offer a smorgasbord of international treats, including organic Italian tomato and vegetable spreads; natural and organic wines such as Robert Sinskey Merlot, Le Corti and Domaine d'Aupilhac; all-natural Aunt Gussie's Pecan Meltaways; and Pure Imagination Chocolates. So they're healthy, but are they good? Terry August, CEO of the Los Angeles-based company, says she and her entire staff personally taste all of their products before including them in their baskets. No word on whether she's hiring.